Watch an intimate, early morning performance of “Swan Dive” at a bar in Austin, Texas during South By Southwest. This video was originally created for WNYC’s Soundcheck for its SXSW coverage. Finding time for quiet reflection is practically impossible in Austin, Texas during South By Southwest. That is, unless you get yourself outta bed early before anyone else is even thinking about waking up, and hoof it across to the east side of highway to meet up with a musician. It was a crisp, spring morning — about 8:30 or 9 a.m. — when Katie Crutchfield rolled up to the shady, abandoned patio of the Yellow Jacket Social Club, a bar near the train tracks and a colorful, always-morphing graffiti wall. With a halo of sunshine just peaking in the sky, this out-of-the-way location made for quite a tonal shift from the busy streets of downtown the night before. And it seemed just right for Crutchfield’s lovely and intimate songs. The Philadelphia-based (by way of Birmingham by way of Brooklyn) Crutchfield, now 24, has been writing music for roughly 10 years — playing in the D.I.Y. punk band P.S. Eliot, which included her twin sister Allison. Now recording and performing as Waxahatchee, Crutchfield’s emotionally exposed songs reflect themes of isolation and self-doubt, of anger and frustration, and of the messiness of love and regret. 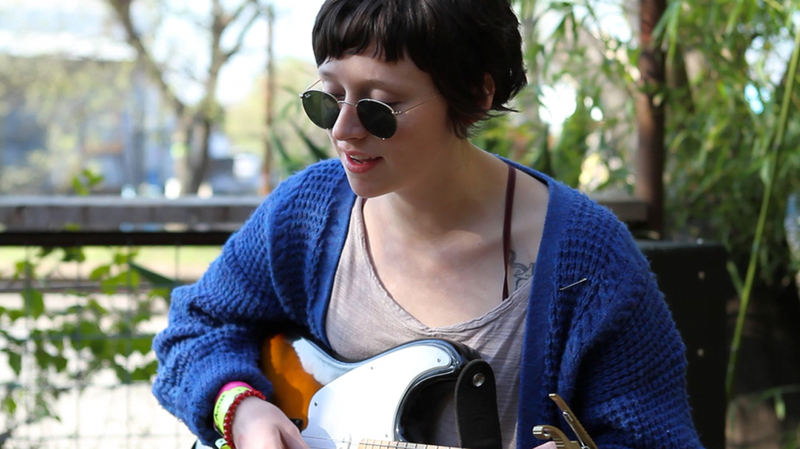 Equally innocent and disillusioned, Waxahatchee’s songs like “Be Good” and “Grass Stain” from 2012’s superb American Weekend — are rough and thread-bare: Bedroom-style recordings with only an acoustic guitar and a trembling voice that felt urgent, as if captured minutes after writing so they would not dissipate and be forgotten. This year’s excellent follow-up, Cerulean Salt, retains that spirit while asserting some power and confidence behind the fragility. Now a three-piece band, Waxahatchee’s songs shift from acoustic to distorted electric guitars and the drumming of Crutchfield’s boyfriend Keith Spencer (of the band Swearin’). The record proves to be another heart-wrenching, yet beautiful batch of songs that deal in uneasy feelings, dysfunctional relationships, and devastating honesty. Sitting on a picnic table, with birds chirping and a subtle din of distant machinery, Crutchfield retrofit one of her new songs — the stunning “Swan Dive” — paring it back to simply an electric guitar and her un-mic’d vocals. The result is a winning and earnest performance that splits the difference between both Waxhatchee sounds. It was the perfect start to the day. Credits: Producer/Editor/Videographer: Michael Katzif; Audio: Rachel Neel; Special Thanks to: Yellow Jacket Social Club, Austin, Texas.